OMG she is gorgeous and as she is still very young and obviously responding well to training I'm sure she will make someone a fabulous companion in time. Both GSD and Husky's are VERY bright and learn very quickly (good and bad habits!). She's lovely. I'm sure she'll thrive with you, Andrea. Keep us updated! This is sasha, 6 months old on 5th April. Very sweet tiny girl but a nerovuse wreck. Doesnt like her collar or neck area tousched and nipping if done so at the moment in fear She is terrified of feet also. It looks like this girl has been pulled about and possibly kicked. There was 6 children in the house and they werent taught to respect a dog, pushing and pulling her whilst she was trying to eat No wonder she is a wreck..
Well what ever the reason is for breeding at least a rescue was contacted.. If not pts could easily of been sold on to anyone and anything could of happened though i dont think that entered the families head tbh, they wanted gone asap and pts was easiest answer.. . 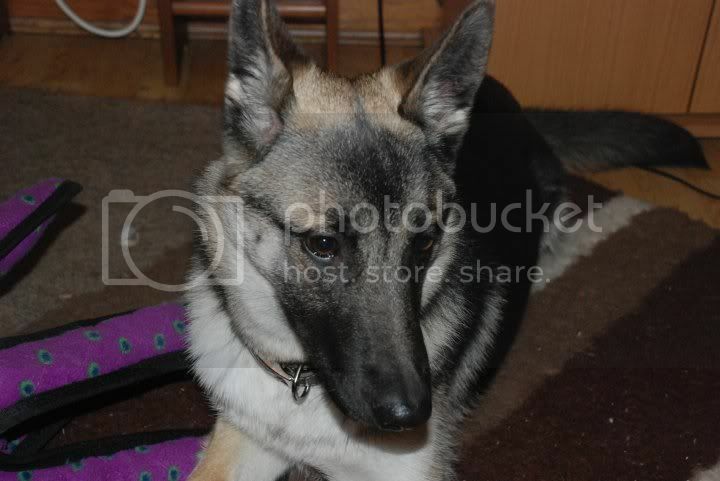 But OMG their first dog and they have a Shep/Sibe why do people not bother doing research. GSD x Husky are an incredibly popular mix due to the whole Northern Inuit/Utonagan/wolf Dog craze at the moment, so I'd be wary that is was an accidental mating. He certainly needs a proper home. Really hope he can get out of there and not PTS when he's not done anything wrong. He certainly sounds very typical of both breeds. Ok, assesment done, foster secured and pup being collected right now. This puppy is being gotton to safety now.. Tiny little thing at the moment, the man who assesed her said smaller than he exected with the 2 breeds in her for her age. She looks like a mini GSD. Once we have her back to safety and she has settled we will post some piccies and update.. He is a GSD x Husky..
Little bit worried as though we have found a asseser pretty fast, the woman has stormed out with the dog saying to walk him. I am hoping thats all she is doing! The hubby said as soon as she is back he will call so we can get assesor round. Assesment being done this afternoon. LADY CALLED ME AS SHE REHOMED SOME PUPPIES AFTER ACCIDENTAL LITTER. THE FAMILY THAT ADOPTED ONE FROM THEN DIDNT SET BOUNDARIES OR DO ANY TRAINING AND NIPS AND MOUTHS ALOT AND GENERALY RULES THE ROOST. hE IS ONLY 5 MONTHS (ALMOST 6) tHEY HAVE DEMANDED THE DOG IS OUT ASAP OR PTS. THE LADY WHO THE PUP CAME FROM CAN'T TAKE HIM BACK BUT IS REAL WORRIED. SHE HAS GONE ROUND AND WORKED WITH THE DOG SEVERAL TIMES BUT THE FAMILY DOESNT FOLLOW THROUGH WITH ANY OF IT IF WE CAN GET HIM ASESED ASAP AND INTO FOSTER WE CAN SAVE HIM FROM BEING PTS..
Can anyone in Derby or local areas of DE7 do a assesment?